A very interesting reunion has happened. No, Brad Pitt and Jennifer Aniston aren’t getting back together, instead it is a collection of the world’s oldest masks, 12 to be exact and dating back 9,000 years according to sources, being displayed in one exhibit. 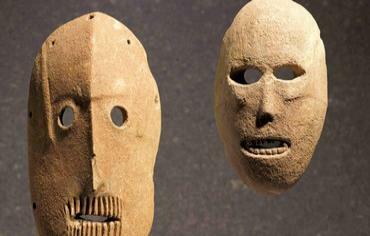 Found in Israel, the masks will be joining a unique collection in the Israel Museum of Jerusalem where people from all over the world will have the chance to look at the primitive stone masks. Archaeologists and researchers conclude that the masks were most likely created to depict the faces of dead ancestors, to ward off evil spirits, or to be used as ritualistic masks of pagan worship connected with medicine or magic. It is also a significant time to be unveiling such masks in Israel, for the Jewish festival of Purim is just around the bend. Purim is the holiday where Jews all over the world read from the Megillah (Book of Esther in the Bible) and remember when Queen Esther and her Uncle Mordecai gained favour from the king of Persia to save all the Jews of the realm from the evil plots of Haman. During this feast, Jewish children, and party-goers, parade around in costume (sort of like Halloween), eat pastries called, “Haman’s Ears/Pocket/Hat” and celebrate God’s provisional saving power. Here is the link to the article on Jerusalem Post. This entry was posted in Archaeology, Bible, Canaan, gods and goddesses of Canaan, Israel, Jews, mythology, Persia and tagged archaeology, Biblical Archaeology, Esther, Israel, Israel Museum, masks, Megillah, mythology, Purim. Bookmark the permalink.